The promotion, which ran for the month of December 2008, was open to all customers who made cash or credit payments in the month of December. A draw was done from which three top prize winners were selected along with five consolation prize winners. First prize winners Alexia and Nolan Nanton, of Lodge Village, said they felt âFavoured and blessedâ by her prize of a wardrobe. 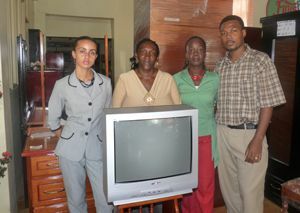 The happy second prize winner Dian Patterson, of Sion Hill, won a 21-inch Sharp television. The third prize, a telephone seat, went to Sydney Ash, of Barrouallie.